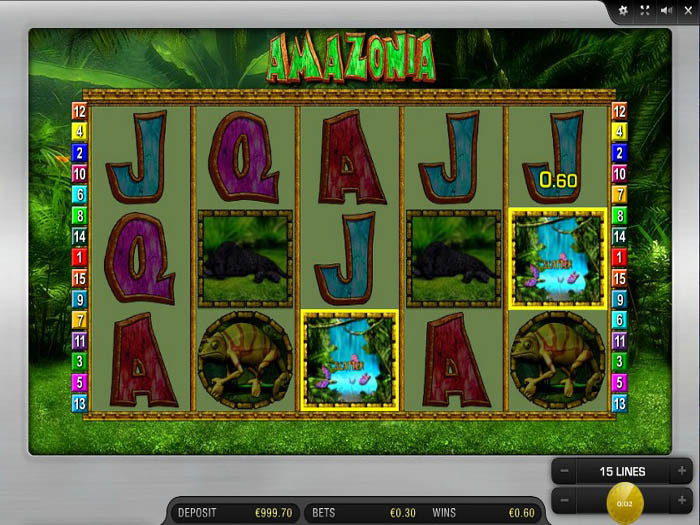 Amazonia Online Slots - Play for Free Today! Amazonia Online Slots is a highly entertaining video slot machine that comes to players from the rich and the varied gaming portfolio of none other than Merkur Gaming. The game takes players to the Amazon rain forest where they can join the Amazonia tribe. This tribe is run by tough, strong and beautiful Amazon women who do not need anything from anyone. They hunt for food, raise children and control the tribe, just like some Amazon tribes that are still this way up to this day. Players will get to enjoy the company of these Amazon Women in a one of a kind forest themed adventure. That is not all, as these Amazon tribes were known for their fortunes and treasures. This is why players will get to search for these fortunes in the forest as they play the game so they can grab their own share. The symbols that would spin on the 5 reels and the fifteen lines of the game include an Amazon lady, a frog, a lizard, a beautiful waterfall, a tiger and a temple. All what players have to do to enjoy all of that is place bets through the control panel of the game so they can start spinning the reels and enjoying the ride. Players will choose how many of the game’s fifteen line do they want to activate as well as the value of the coins, which vary between 0.01 and 2 credits per coin. The slot also has the Bet Max button that allows players to easily place the biggest bet that the game has and spin the reels at the same time. Like all other Merkur Gaming slots, the game comes with the auto play feature that gives players the chance to set a number of spins so they can kick back, relax and watch the reels as they spin alone as they reap the great payouts that the slot has to offer them. Speaking of rewards, players will get to claim a reward whenever they manage to get at least 2 or 3 of the same symbol (depends on each symbol) on the same line from the left to the right. All of the prizes that the game has in store can be viewed by players as they click on the paytable button that is found under the reels on the left side. The game has a couple of special symbols. They include the wild icon that acts as a joker in a deck of cards as it can fill in the place of other symbols, except the other special icons of the game, to help players form a high paying combo. This wild icon is the Amazon lady. The other special icons include the scatter waterfall that gives scatter pays, the bonus temple that gives mystery wins and the Black Panther that can give a number of free spins with multipliers. In Amazonia Online Slots 5 reels and the fifteen lines of the game include an Amazon lady, a frog, a lizard, a beautiful waterfall, a tiger and a temple. The gameplay, graphics, and payouts keep you coming back for more!